Chris has 2 young daughters in the club and after an appeal by Head Coach Al for male volunteers Chris came forward to offer his hand. Chris enjoyed gymnastics as a child and since his girls have got into the sport his interest has been rekindled. 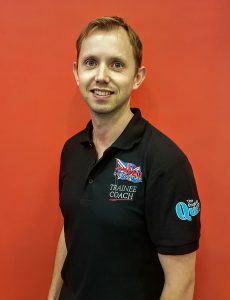 He will work with numerous members of staff covering a range of ages and abilities to get an understanding of the sport and to learn how to teach.